Click here for a free estimate or quote on your new Stained Floor. 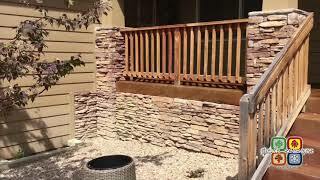 Concrete staining, by far, is the most artistic and durable concrete coating we offer. It can be used indoors, outdoors, commercial, or residential. It will never fade, never chip and never peel! The process is permanent, however, it does require maintenance just like any other concrete coating. The maintenance is affordable and more times than not, you can do it yourself! Much like concrete polishing, if there is tile to be removed from the slab, more than likely you’ll see a “ghosting” of where the tile was through the stain. Real concrete staining is translucent, meaning, you’ll see the slab through the stain. If you have older concrete or some type of flooring on it now, it can still be stained, it will just look more weathered and rustic. The mass majority of my staining jobs are home remodels. Most of my customers go with this look versus putting down a new layer of concrete to hide those blemishes. The slab is always the strongest, most durable base that can be offered. If necessary we skimcoat with a micro topping finish, in case a more “even” look is desired. We always fill all the debits and tack strip holes from the removal of carpet, with concrete patch. We do take it a step further and use some of the powder from the grinding in the patch, thus supporting the greatest match possible. Once all the prep work is done, whether it’s new or old, it is time for the stain. The stain works with the lime in the concrete . When the concrete was first poured and was curing, the lime rose to the top, however, it never rises evenly. Where there is a lot of lime, you get the darker browns, and where there is a little bit of lime, you get more of a tan color. There is no such thing as a solid colored stain when it comes to real muriatic acid staining, because of the lime in the concrete. I’m a big fan of the real acid stain over water-based stains. Water-based stains look contrived to me and they sit on top of the concrete not making them as permanent as real acid stain, which etches in to the concrete. Once I have laid down the stain and it has had time to bake, Prior to staining I always do color approval with the customer. This means that initially we agreed on the color and it’s time to see if that color matches our vision. More times than not, I have nailed the color and it’s time to move to the sealer and the wax. Your average cost based on 1000 ft.² of new concrete interior staining is $4.00 a square foot from start to finish. If it is new concrete and it is exterior, based on 1000 ft.², it would be $3.50 a square foot from start to finish. If the concrete is old and has flooring on it already, there are a lot of variables, however, on average, it starts at $6.00 a square foot, based on 1000 ft.² from start to finish. On old exterior concrete would have to see it in person because sometimes it’s not a candidate for staining due to the concrete being too worn. Concrete staining comes in a multitude of colors and can be altered quite a bit, not to mention, I offer artwork and design. The artwork is always by the piece and would have to be discussed and priced out. I can say this though…I love to do art and design in my floors! To me, it’s what makes a floor personal because it’s a piece of artwork that you’ll talk about for years to come. I make it very affordable so people are able to do something extraordinary. Concrete staining will create a unique look making your flooring have a personal touch. Resists oil stains, beads water, and wipes super clean and will create a seamless surface. Staining is durable and can last a lifetime if properly maintained. Different colors and patterns can be combined to create a personal expression. 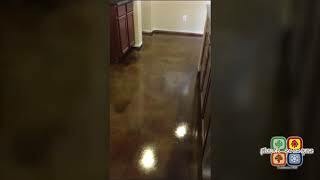 Stained concrete is very beneficial for both allergy and sanitation purposes.